Bookmark / favorite toolbar is good feature to save important links. But some users don’t want this toolbar always viewed in browser. 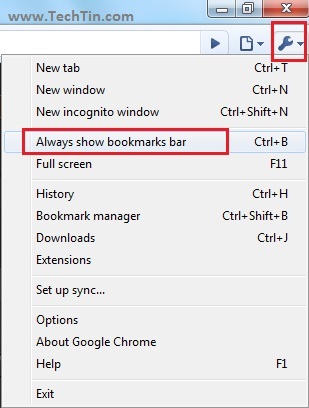 Here is how you can show or hide bookmark toolbar in Google chrome browser. Launch Google chrome and click Tools icon. Check “Always show Bookmark bar” option to show the bookmark toolbar. Un-check “Always show Bookmark bar” option to hide the bookmark toolbar. Press Ctrl + Shift + B keys to show bookmarks bar. Press Ctrl + Shift + B keys again to hide bookmarks bar.